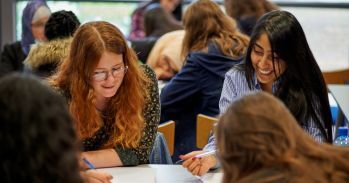 This full-day event for Year 12 girls (ages 16-17) studying A-level Mathematics is designed to give a stimulating introduction to advanced mathematical problem-solving, and encourage more girls to study Mathematics at university. The day will include talks giving an accessible insight into some of the areas of maths encountered at university, and interactive problem-solving workshops. The event will give an insight into the challenging, exciting and rewarding mathematics encountered in a undergraduate degree, and will support students to develop their mathematical thinking and confidence in tackling challenging problems. The day is hosted jointly by the Faculty of Mathematics, University of Cambridge, and the Isaac Newton Institute for Mathematical Sciences, with speakers from the Faculty of Mathematics and workshops led by staff from NRICH and Underground Mathematics. The day will also include a parallel information and CPD opportunity for accompanying teachers, exploring the free online A-level Mathematics and STEP preparation resources offered by the University of Cambridge. Each student will take part in two different highly interactive workshops during the course of the day. Workshops are led by staff from the NRICH and Underground Mathematics projects within the Cambridge Mathematics Faculty. This event is free, but open to school groups only, and places must be pre-booked. This event is aimed at Y12 girls studying A-level Mathematics, especially those who may consider studying a mathematically-related subject at university. Schools/colleges are welcome to bring up to 10 students, plus accompanying teachers (all student groups must be accompanied by at least one supervising teacher). Students must be taking A-level Mathematics (or equivalent): in schools that offer Further Maths A-level, we would expect these students to be Further Mathematicians, but students from schools which do not currently teach Further Mathematics are also warmly welcomed. Please note that there has been an extremely high level of interest in this event, and it is now fully booked. Thanks to funding from the University of Cambridge Widening Participation Project Fund, we have a limited number of small grants available to help contribute to travel costs and/or teacher cover, particularly for schools/colleges which are a considerable distance from Cambridge. Please note that only non-selective state-funded schools, colleges or academies are eligible to apply for these grants. Please register for the event before applying for a grant. To get advance notifications about future school events, please sign up for the NRICH teacher email newsletter or follow us on Twitter. If you have any questions about attending the event, eligibility or booking, please email us. Y12 girls taking A-level Mathematics (or equivalent) - please note this event is open to school groups only.